Just like the surprise return of a critically-acclaimed but unpopular television series, my attempts at urban gardening are back for another season. 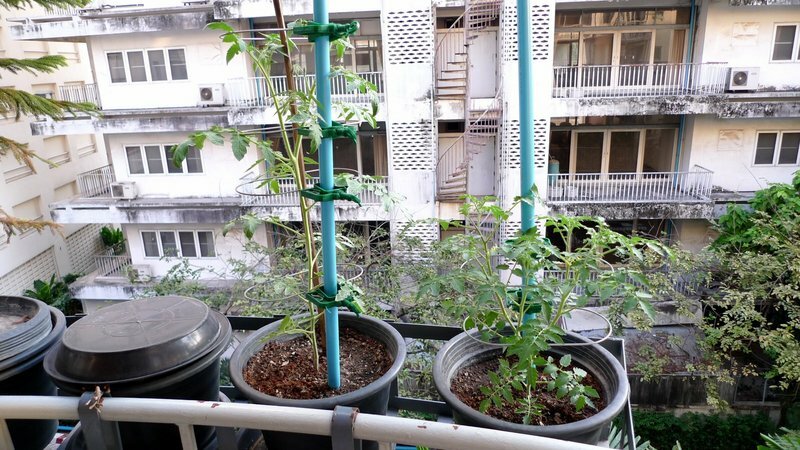 The story of a green-thumbed underdog trying to coax vegetables to grow in a balcony planter under the hot and humid Thailand sun had a well-documented first season. This season’s theme is “hot and humid tomatoes”. The soil is more fertile and the vines better supported, but will the plants yield any fruit? Tune in to find out! 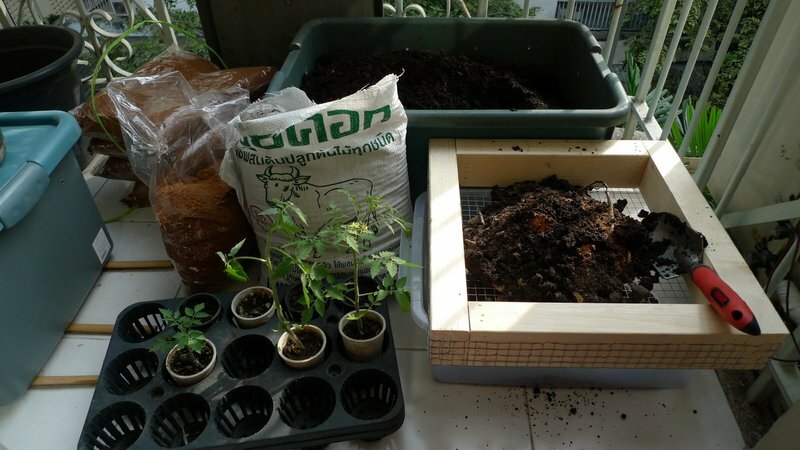 I ended last season (which, because of my south-facing balcony, is roughly November through April) realizing that my soil had too much clay in it and that I was growing tomato varieties ill-suited to the heat and humidity of Thailand. Tomatoes like hot weather but most varieties require relatively cooler nighttime temperatures so the fertilized blossoms set. To address the first issue, I ended last season by creating two compost bins, filling them with the remaining soil from the first season’s plants, and adding kitchen scraps, coffee grounds, and eggshells every week. The earthworms bred like rabbits and by December, I had a much better quality of soil. To remove the clods, stones, and other debris, though, I needed a dirt sifter. 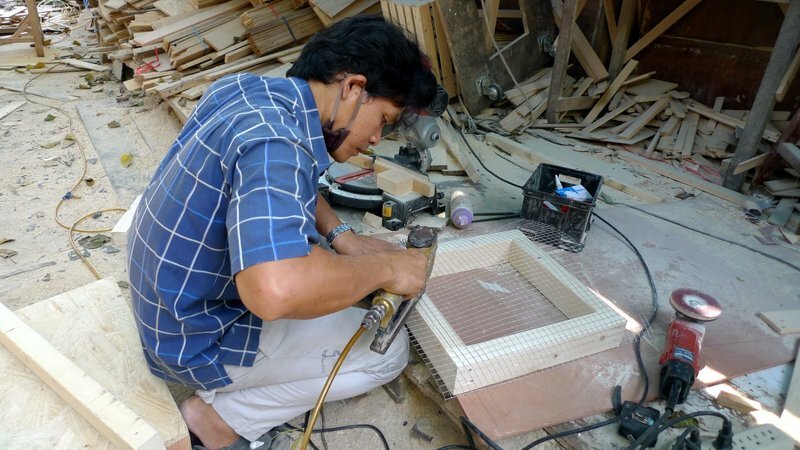 Dragging my personal assistant to the port-side wood working district, we arranged for a local carpenter to build a sifter using some chicken wire I purchased at the hardware store and some scrap wood from a packing crate. The sifter worked perfectly and over the course of a few mornings, I removed the larger objects from the soil while amending it with ground coconut husks (perfect for aerating the water and helping to retain moisture) and steer manure. To address the second issue, tomato blossoms not setting, I ordered the “Tropical Hot and Humid” seed collection from TomatoFest.com. Among the varieties I received are, from left, Radiator Charlie’s Mortgage Lifter, the Hawaiian Currant, and the Arkansas Marvel. They are all heirloom varieties and all are supposed to do well under tropical conditions. Season two is well underway with the first blossoms starting to appear on a variety called Anahu, left, and the Hawaiian Currant, right. Last weekend I transplanted seedlings for the Mortgage Lifter and Arkansas Marvel, and planted seeds for another three varieties including the delicious sounding Chocolate Stripes. We will see what happens and whether the improved soil and more carefully selected varieties will be sufficient to make my garden a productive one this season. Otherwise, I may just have to give up and be content with herbs. This entry was posted in Uncategorized and tagged compost, garden, gardening, tomato, tomatoes by christao408. Bookmark the permalink. I have a gigantic garden that need care, but now it is winter. Tomatoes is a fickle plant, I tell you. The last few years I have failed and the least probably 4-6 rippen tomatoes and the others are ill and does not ripen rightly. (not sure if I said it that right)The last year summer, I had more than 30 tomatoes of which was to my surprised was the best year for all my veges. I had those brocolli, cauliflowers, onions & garlic, some chillies & brussel sprouts. We did managed to make an experimental of making/preparing mushrooms using the compost. And I also did managed to prepare my own beansprouts.Since the few years back when Europe had the controversy on the chemical use on food products occured that has made people sick, I was not impress having the government putting risk on experiementing on the people with new food products that are not save either for adults, nor kids. Since then, I do gardening of my own and it is safe. The least I know no one puts chemical in my food! When I lived in the Midwest, I had a huge garden and hardly had to buy any vegetables. Down here, in central Texas, there are so many bugs and diseases, and it gets so hot, that it’s a struggle to grow good things. I’ve never had much luck with tomatoes in pots. 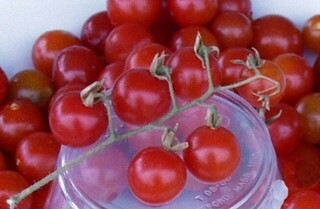 I hope your tomatoes turn out as beautiful as those in the pictures! Sounds like you started with TLC for the plants. They do need loving care.Don’t give up on them and keep the herbs growing too. You know we all love to spice up dishes with fresh herbs. Wait a sec… you have a personal assistant? They have been pushing tomatoes that grow in pots that hang in the air. Also you can use used tea bags to add to the water that you use to water the tomatoes (good ph adjusters). For citrus a lot of folks like growing kumquats. They also can grow in pots and containers.For herbs will you try mint or basil? I wish you luck with your maters<:) This is the first year in 11 years since we sold our house and moved to an apt., that we are downstairs and I have an area in the front, underneath my front room window. I am excited and am going to plant some tomatoes & a few other things. The neighbor next door, who has lived here for 15 years has a beautiful garden every year plus the community garden out back. She is going to give me a list of what grows well, and easy out front.I am excited. I am really inspired by your efforts Chris! We don’t have a balcony, but I might just try and see if a pot of tomatoes will grow in our apartment. I’ll place it next to the windows in our living room. You remember how the windows are, right? It should have enough sunlight coming from almost all directions. Will get it started in the next few weeks. I also bought some heirloom tomato seeds while I was in Australia. Cross fingers I’ll get beginners luck! For the second year in a row, I have tomatoes still growing after the season is supposed to end. I expect great things from you this year. good luck for this season. 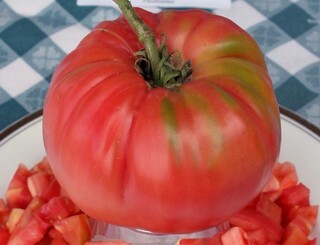 your tomatoes from last season were gorgeous. Best of luck with your tomatoes! you garden looks well as usual i am impressed by the different types of tomatoes. i have a hard time with tomatoes they don’t like to produce fruit just grow and bloom like crazy with no fruit always have at least two plants and never get more than one or two tomatoes even though i may have twenty blooms. herbs do well especially rosemary, sweet basil, and cilantro the others do ok except the parsley is always sparse. the flowers do much better all kinds seem to flourish even in winter and always have good fruit crop on the miniature trees. i noticed last night that there are tangerines on the minature tangerine tree they are about the size of an egg right now. looks like you are putting in a lot of effort; i hope you will be well rewarded! i need to redo my little container pots; the soil is in need of some fertilizing and reworking, especially after last summer. i haven’t decided what to grow for this year. 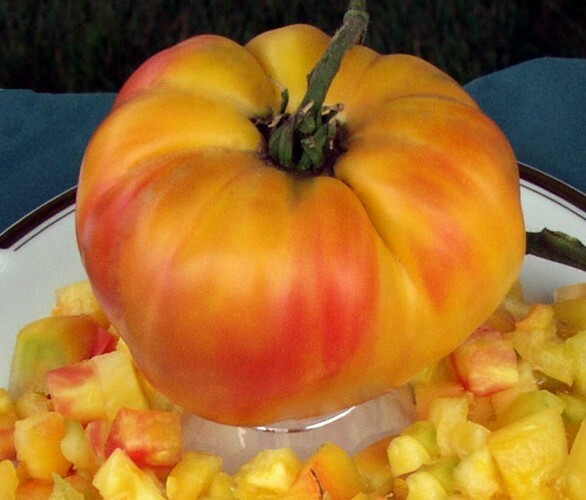 your mention of tropical tomatoes reminded me that someone gave my parents an heirloom tomato plant, and they have been somewhat successfully keeping it going. i’m not sure what variety it is, but i know it produces small, yellow tomatoes about the size of a grape tomato but have a slightly more unusual shape. Growing things is fun! And those tomatos look really delicious. Tomotoboi must be proud. @secade – I don’t think he reads my blog…@kunhuo42 – One of the types I have matches that description. Hope they work out! I am of the mind that if I don’t get good results this season, I may just scrap the idea so long as we are living in a condo. Honestly, I don’t think I get enough sunlight in this location. @grannykaren – Yes, that’s the same problem I had last year and, so far, the same problem I’m having this year. Healthy vines, lots of blossoms, no pollination…@crankycaregiver – Thank you@rudyhou – All three of them… LOL@murisopsis – I’m eager to try them, too. I sure hope they grow this year. @Inciteful – Pressure! @Ricardo98 – Global warming? Ha ha!